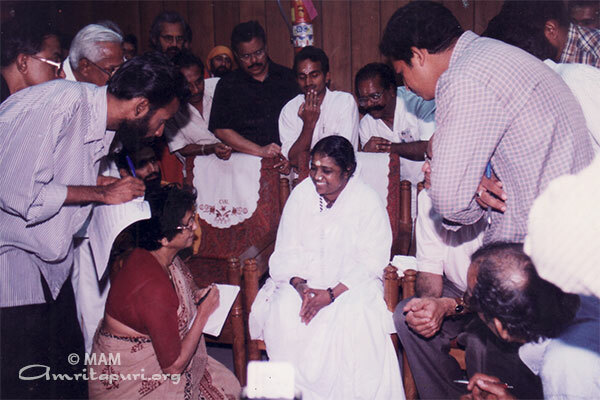 When Amma’s plane landed at the Cochin Airport, local news reporters were awaiting Her arrival from the U.N. Summit in New York. 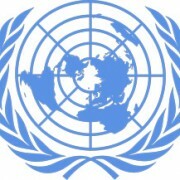 Question: How did you feel speaking in Malayalam to a foreign audience (this is the first time that someone is speaking in Malayalam in the U.N. General Assembly)? 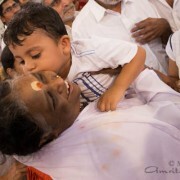 Amma: I never felt any difference. Just like I am talking to you, I was talking to them. Question [by a woman reporter]: We are happy that Amma spoke up for women while She was at the U.N.
Amma: In many nations, women are oppressed; they don’t even have the basic freedoms of life. In God’s creation, women and men are equal. They should have equal freedom. In the West, women are coping with oppression by acting like men – they cut their hair, smoke cigarettes and drink – thinking that this will make them equal to men in society. But men are also unhappy with their lot in life, and try to become more like women. But both are reaching nowhere. Women should invoke the positive masculine qualities and men should invoke feminine qualities. Every individual should have both courage and compassion. Women give birth to men. Because she’s a creator, if she loses patience, the harmony of the world will be lost. 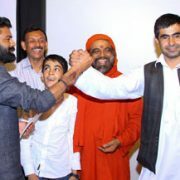 Now Indians have started imitating the West. Amma is happy if Indian women gain the courage of Western women, but still maintain their motherly qualities. If the heart is lost, the culture is lost. En route from the airport to Amritapuri, Amma was received by thousands of people as her car inched along the roads full of well-wishers. In the local villages and along the seaside road to the Ashram, every household irrespective of their religion or caste honoured Amma in the traditional way – by lighting oil lamps, burning incense and waving camphor in front of their homes. 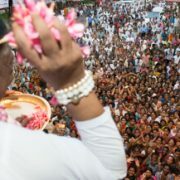 Many offered garlands to Her and showered her with flowers. Others . As Amma’s car approached, they offered incense, flowers and light to her, rushing to Her window to have a glimpse of Amma’s enchanting smile and to touch her. Others stood with folded palms, in reverence and love, in front of their houses. Enthusiastic cheers and firecrackers announced Her progress. Amma spent almost four hours driving the last seven Kilometres, taking time to give prasad to everyone she passed. The enthusiasm and joy of the crowd reflected the pride they felt in what they thought of as an invaluable contribution to presenting the glory of their ancient culture in front of the world. The respect and honour that Amma received from such an august world body also added to their joy.